We are currently designing a custom 15 ft. long live-edge Acacia wood slab and bronze base dining table for one of our clients and came across this inspirational image. The newly renovated kitchen of Dwell founder Lara Hedberg Deam and her husband, SF architect Christopher Deam features a 14-ft. long live-edge Walnut slab slab below a trio of hammered brass Beat Lights from Tom Dixon. 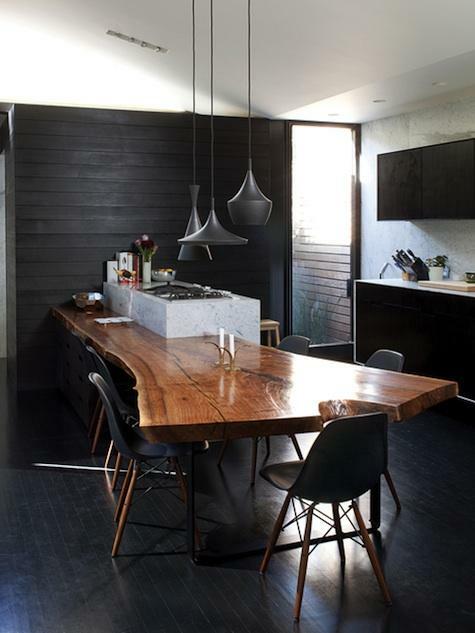 What a novel way to combine dining area with countertop; and very interesting juxtaposition of marble and wood set against black-stained wood cabinets and walls!